It was no surprise that Apple held a private memorial for Steve Jobs on the company's Cupertino campus on Wednesday. After all, we had already told you that there was speculation that the service would be streamed to Apple Store employees around the globe as the stores shut down for an hour so that store employees could join in the ceremony. Making an emotional appearance was Jobs' replacement as CEO, Tim Cook. The executive couldn't hold back tears when discussing his friendship with his former boss. Other dignitaries that attended were former Vice President Al Gore and Intuit Chairman Bill Campbell, both of whom serve on Apple's Board of Directors. Campbell shared a story about how when Steve Jobs first heard about Siri, he inquired about its gender. Rock band Coldplay entertained those in attendance or watching the streamed video. Apple also changed the web page it put up in memory of Steve Jobs at Apple.com/stevejobs by adding messages from people around the globe. Most of the stories remembering the life of the co-founder of Apple had to do with his constantly high standards for the products that Apple launched under his reign as co-founder, chairman and CEO of the company over the years. 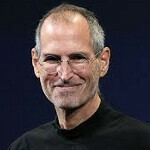 And a version of the famous "Think Different" commercial was played, with Jobs having the role of narrator for the ad. When it did air on television, Jobs' had his voice-over replaced with a professional announcer so that the focus wouldn't be on the Apple executive. It seems that when Steve Jobs died on October 5th from complications arising from Pancreatic Cancer, he was still working on a new Apple product. Softbank Chief Executive Masayoshi Son revealed in an interview that he was at Cupertino the day of the Apple iPhone 4S introduction. During a meeting with Tim Cook, the latter got up to take a call from Jobs. Cook told Son that "He said that Steve is calling me because he wants to talk about their next product. And the next day, he died." According to Ashok Kumar with Rodman & Renshaw, the last product that Jobs was working on was the Apple iPhone 5 which will have a slimmer design and a larger screen according to the analyst. I agree in principle with CivicSi89, but that kind of language is uncalled for, even if it's censored. Hi Everyone. I've made a video to honor this man, with his best moments. Here is the link: http://vimeo.com/30738303 Feel free to comment.